35 Charolais bulls sold to an average price of £3870, peaking at 6,900gns with a clearance rate of 74% at the Welshpool sale on Saturday 2 May 2015. The top price of 6,900gns went to the 21 month old reserve champion Dawson Invictus TI +63 SRI +64. Invictus who was exhibited by Rachel Dawson, Newton Burgoland, Leicestershire is sired by Blelack Digger and out of a homebred dam going back to the 55,000gns Sportsmans Columbo, and was purchased by RT Watkins, Abergavenny, Monmouthshire. Two lots from J and A Price, Staunton-on-Wye, Herefordshire were next along. First at 6,600gns was the 19 month old Goldies Eddy son Oakchurch Immortal TI +69 SRI +68, who was purchased by RJ Roberts, Tywyn, Gwynedd. Then the 15 month old class winner Oakchurch Julius TI +66 SRI +67 by Blelack Digger sold to AV Roberts, Porthmadog, Gwynedd for 6,000gns. The next call of 5,600gns was bid for the class winner Maerdy Ironist TI +42 SRI +32 from Esmor Evans, Mold, Flintshire. Purchased by J Jones and Co, Bala, Gwynedd this 17 month old is sired by the 20,000gns, Royal Welsh supreme champion Maerdy Grenadier. The champion exhibited by Kevin Thomas, Castlenewydd Emlyn, Carmarthenshire was next to sell for 4,800gns. The 19 month old Moelfre Indra TI +21 SRI +25, sired by 16,000gns Anside Foreman was bought by R Jones, Penrhyndeudraeth, Gwynedd. At 4,600gns came another Goldies Eddy son, Trefaldwyn Imense TI +43 SRI +39 who was purchased by R Ryder, Machynlleth, Powys from Arwel Owen, Welshpool, Powys. Mr Owen also sold the 17 month old Trefaldwyn Idol TI +41 SRI +42 also by Goldies Eddy later in the day to RG Jenkins and Co, Caersws, Powys for 3,800gns. Another vendor with two top priced lots was RT & DM Roberts, Abergele, Clywd, both were sired by the 11,000gns Gwenog Fieldmarshall and out of homebred dams going back to Alsnow Almighty. The first to sell at 4,500gns was the 16 month old class winner Brynffanigl Intrest TI +36 SRI +36 who was purchased by W Day, Cheltenham, Gloucestershire. Then Edward Brothers, Oswestry, Shropshire paid 4,000gns for the 18 month old Brynffanigl Iwan TI +35 SRI +34. A bid of 4400gns from JR Phillips, Freshwater East, Pembrokeshire secured the 14 month old Blelack Digger son Montgomery Jack TI +52 SRI +51, exhibited by Roberts & Jones, Welshpool, Powys. The same vendor also sold the 15 month old Montgomery Jupiter TI +70 SRI +63 by Balthayock Adonis for 3,700gns to JA Piggott, Malpas, Cheshire. Then Caylers Inspector TI +34 SRI +21, a 17 month old by Thrunton Dominator from Caylers Charolais, Royston, Hertfordshire was purchased by GKE Rees, Rhayader, Powys for 4,200gns. The next lot in the ring securing 3,900gns, was presented by BS Jones, Brecon, Powys. Bailea Igenity a 22 month old son of the 16,000gns Clyth Diplomat sold to TH Williams & Son, Welshpool, Powys. The 19 month old Class Winner Cargriff Ironman was purchased next by T Gayden, Stow on the Wold, Glocestershire who paid GG Morris, Llanstephan, Carmarthenshire 3,800gns for his Blelack Digger son. Another of Mr Morris’ Digger sons, the 19 month old Cargriff Impeccable sold to RJ Williams, Knighton, Powys for 3,500gns. At 3,600gns JN Pugh, Wrexham, Clwyd was next to make a purchase from exhibitor A Platt, Shrewsbury, Shropshire. The class winning 15 month old Lindford Joey sired by the 25,000gns Perth Reserve supreme champion Inverlochy Ferdie. 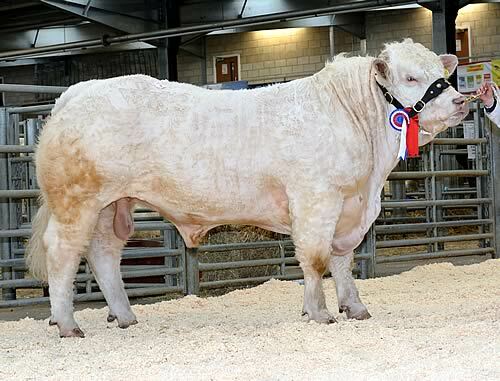 The second lot to secure 3,500gns was exhibited by DJ Thornley and AJ Smith Swadlingcote, Derbyshire. Davally Invader ET TI +41 SRI +39, a 19 month old son of the 30,000gns Dingle Hofmeister was purchased by WE Evans, Llanrwst, Conwy. The only female of the sale was a cow with her eight month old heifer calf at foot presented by RJ & BE Kimber, Chippenham, Wiltshire. The 2008 born Beanhill Damson by the 17,000gns Coolnaslee Universe and her calf Beanhill Jamelia sired by Alwent Goldbar were purchased by Ian Hollishead, Goostrey, Cheshire for 3,000gns.